Holland America Line’s shipboard chefs are learning from the best in a collaboration with renowned Sushi Chef Andy Matsuda. Not only will Matsuda share his knowledge and train the shipboard chefs to ensure that the cruise line’s staff is at the forefront of sushi trends and techniques, but four of his signature rolls will be featured on the dinner menu at Tamarind, the award winning Asian-fusion restaurant on board several Holland America Line ships. 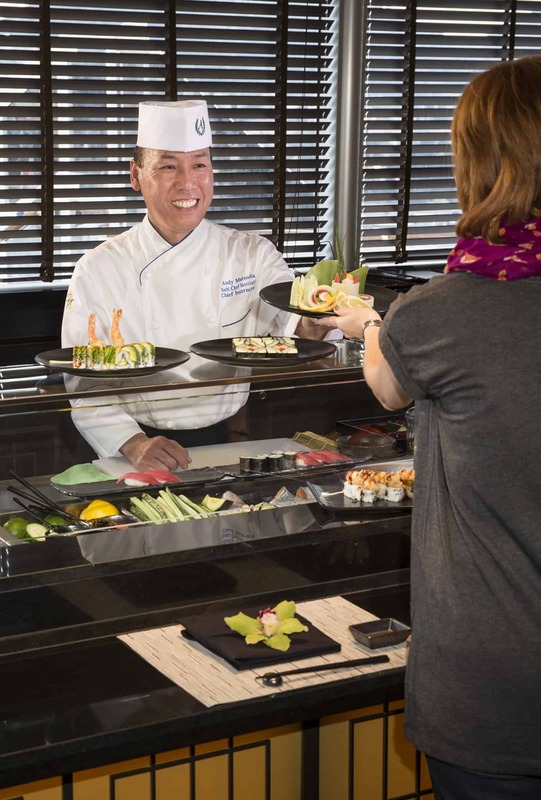 The Japanese-born chef brings more than 35 years of sushi-making experience and 15 years of teaching to the premium cruise line, and he began his collaboration and training aboard the line’s newest ship, ms Koningsdam. At Matsuda’s Sushi Chef Institute in Los Angeles, California, he teaches aspiring chefs and professionals from all over the world about sushi and Japanese cuisine. More than 1,300 graduates of the institute have gone on to careers in sushi restaurants or have become restaurateurs themselves. Guests can enjoy Matsuda’s four signature rolls on Tamarind’s dinner menu. They are a Tempura Lobster Roll with lobster tail, unagi sauce, avocado and asparagus; Nigiri Seared Salmon with green olives and capers; Dragon Roll with tempura shrimp, unagi sauce, avocado and asparagus; and Nigiri Tuna Zuke with yuzu-flavored tuna and guacamole sauce. Tamarind is on bo ard ms Koningsdam, ms Nieuw Amsterdam and ms Eurodam. The Asian-fusion Tamarind restaurant also serves sushi selections on the full dinner menu. Selections feature Spider Roll with soft shell crab tempura, California Roll, Tsutsumi Roll with snapper and avocado, Spicy Tuna Roll, Veggie Rainbow Roll, Volcano Roll with sesame-marinated salmon and Thai chilis, and Nigiri sushi with tuna, salmon and ebi shrimp. Tamarind on ms Koningsdam also features a sushi counter with eight seats where guests can enjoy watching the chefs prepare the fresh sushi. Matsuda learned the joy of cooking at his family’s Japanese restaurant when he was a child, and he went on to have an apprenticeship at Genpachi, one of the most famous restaurants in Osaka, Japan, before bringing his sushi skills to Los Angeles. Following a battle with cancer he sought a deeper understanding of the relationship between food, health, people and the environment, which he then parlayed into becoming one of the world’s foremost sushi experts. Matsuda joins Holland America Line’s elite list of food and beverage collaborators who are the leading authorities in their fields. The line recently announced a partnership with Master Mixologist Dale “King Cocktail” DeGroff, and their esteemed Culinary Council is led by Holland America Line’s Master Chef Rudi Sodamin, who is joined by renowned international chefs Mark Best, Jonnie Boer, David Burke, Elizabeth Falkner and Jacques Torres. For more information call 1-877-SAIL HAL (877-724-5425) or visit hollandamerica.com.